Please stay tuned for an update on events in Spring 2019. The RFSA is planning brown bag lunches and other activities for members. Thursday, December 13, 4:00-6:00 p.m. Please note that half of the board member positions will be elected for a special one-year term; these positions will revert to a two-year term at next year’s elections. This change will improve the continuity of the RFSA Board by enabling half of the board members to be elected every year instead of all board members every two years. If you have questions about serving on the RFSA Board before nominating yourself for a position, please email rfsa@sfsu.edu or contact any board member listed at https://rfsa.sfsu.edu/content/executive-board. 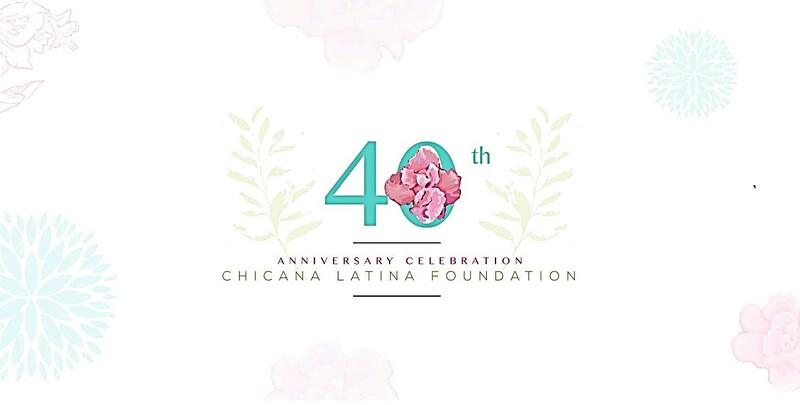 The RFSA Board approved a funding request for co-sponsoring an SF State/RFSA table at the Chicana Latina Foundation's Annual Scholarship and Awards Dinner on October 5, at the Westin St. Francis Hotel. Two Latinx students from SF State are receiving scholarship awards at the event. RFSA members may join the SF State/RFSA table at a discounted price of $125 per person (general admission tickets cost $300). Please email rfsa@sfsu.edu to inquire about the open spots at the table. 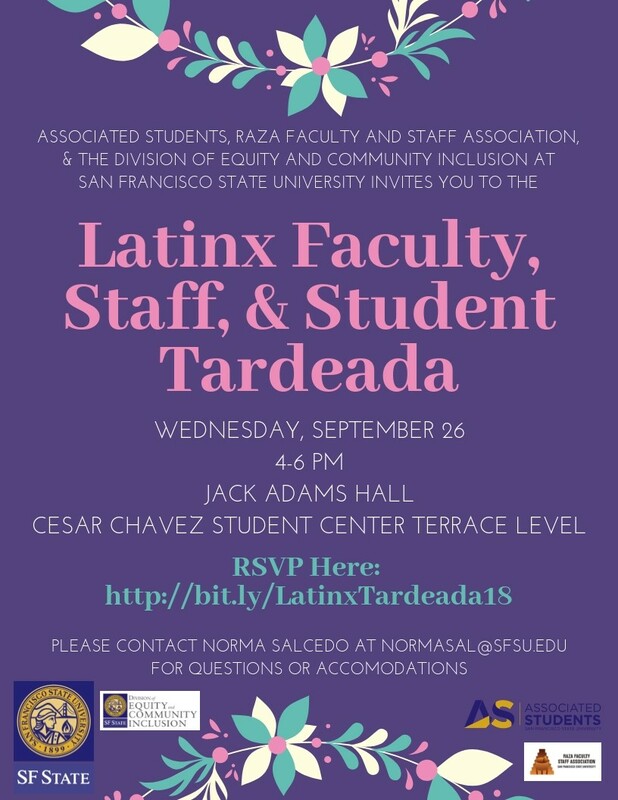 Associated Students, Raza Faculty and Staff Association (RFSA), and the Division of Equity and Community Inclusion at San Francisco State University invite you to the Latinx Faculty, Staff, and Student Tardeada on Wednesday, September 26, 4:00-6:00 p.m. There will be opportunities for you to connect with new and returning students as well as other faculty and staff. We will also be discussing the "Latinx Resource Center" workgroup that the Division of Equity and Community Inclusion is developing to help advise and lead the proposal for a Latinx Resource Center. If you wish to table, please select that option on the registration form. 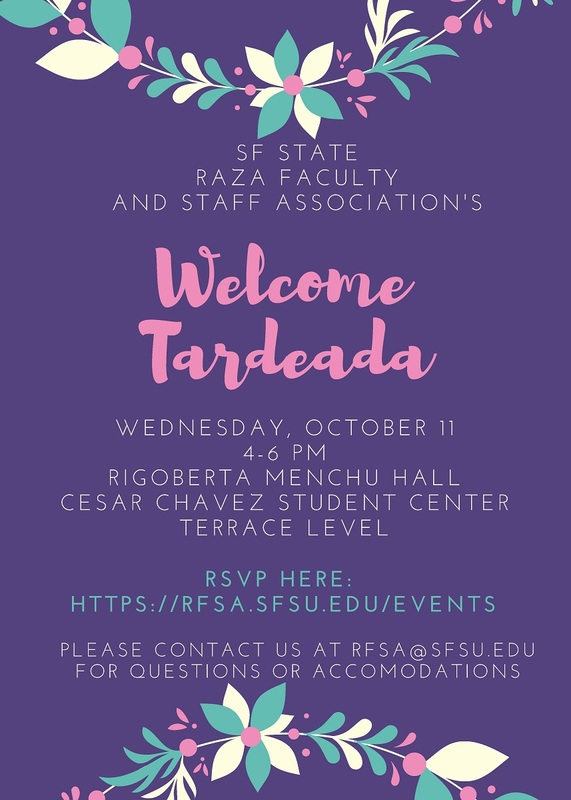 Join us for the Raza Faculty and Staff Association Tardeada on October 11. Meet and connect with Latina/o/x faculty, staff, and allies from across the campus. Light refreshments will be served. We’re looking forward to introducing our new RFSA members; our Latina/o/x colleagues in new leadership roles including AVP for Equity & Community Inclusion Manuel Alejandro Pérez, College of Science and Engineering Dean Carmen Domingo, and Latina/Latino Studies Chair Katynka Martinez; and our Dream Resource Center colleagues. 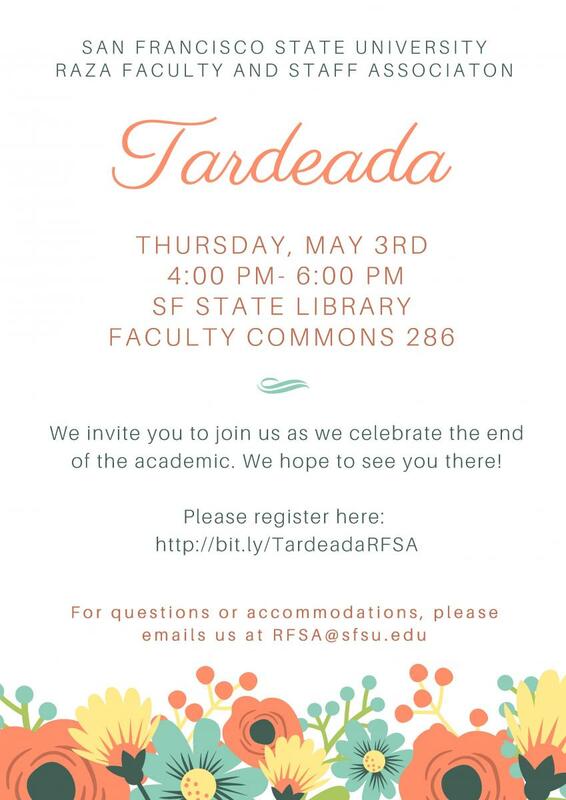 Please contact us at rfsa@sfsu.edu for more information and accomodations. 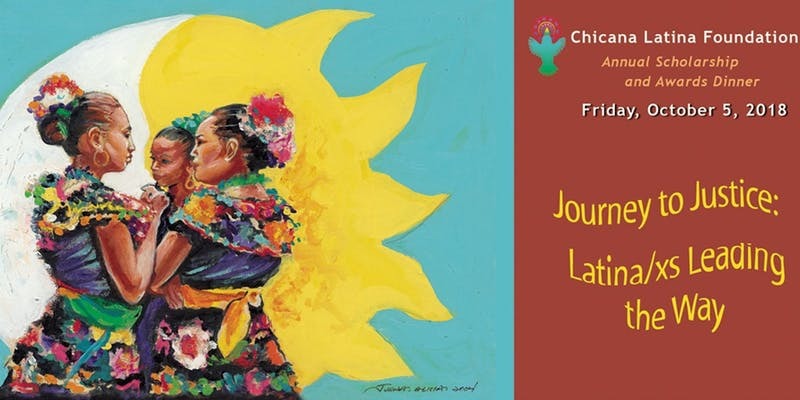 The SF State Raza Faculty and Staff Association is hosting a table at the Chicana Latina Foundation’s 40th anniversary gala on September 28. The Chicana Latina Foundation regularly provides scholarship awards to students at SF State. Active RFSA members (dues paying members) may join the RFSA table at a discounted cost of $150 per person (regular tickets cost $300). Email rfsa@sfsu.edu to join the RFSA table. 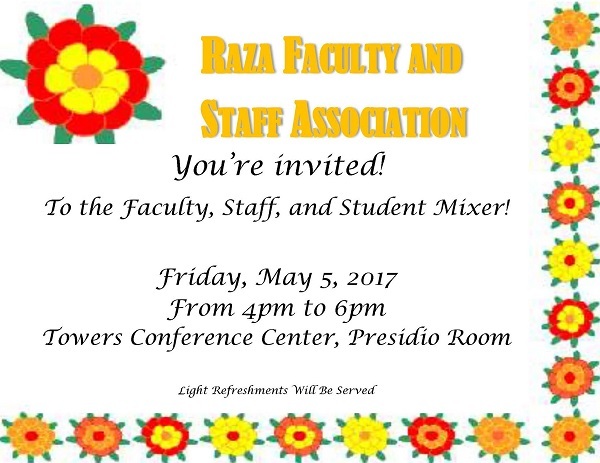 Join us for the Raza Faculty and Staff Association mixer on May 5th. Meet and connect with Latina/o faculty and staff and allies from across the campus. RSVP to be eligible for door prizes; must be present to win and collect. If you have questions, please contact Gabriela Segovia-McGahan at gsegovia@sfsu.edu.